Step 1: An ultra-dry bond protector that instantly helps shield hair from chemical service damage, improves color deposit, and provides greater, more even lift when lightening. Professional use only. Just spray and go—no messy, complicated mixing or measuring! Step 2: An intensive treatment to help strengthen bonds and hydrate–for damage-resistant, healthy-looking hair in just one use. Professional use only. SHAKE CAN VIGOROUSLY. Apply to dry hair prior to chemical service. Apply starting at the back of the head, spraying onto horizontal sections, 3-6 inches away from the hair. Spray in short bursts. Continue this application method until all sections have been treated. If you have sections of hair that are more damaged than others, you may reapply ProSeries 1 to those areas for added protection. Comb through hair to ensure complete, even distribution. Perform color or lightening service as usual and according to manufacturer’s directions. Once haircolor or lightener has fully processed, rinse or shampoo hair (depending on manufacturer’s directions), then follow with Defy Damage ProSeries 2. Apply ProSeries 2 to damp hair. Leave in for 5 minutes. Rinse. Note: To use as a treatment without a color service: spray onto dry hair, then shampoo. Follow with ProSeries 2; leave in hair for up to 5 minutes, then rinse. How are they broken or damaged? Joico’s new Defy Damage ProSeries harnesses the power of three proven “hair heroes” along with intelligent SmartRelease Technology to protect and strengthen hair bonds before, during, and after every color and lightening service. It also works brilliantly as a stand-alone treatment to help rebuild, strengthen, and protect hair from the inside out. Does Defy Damage only prevent damage? No, Defy Damage addresses existing damage as well as future damage. How does SmartRelease Technology work? During product use, SmartRelease Liposomes are deposited onto hair strands. Over time, each SmartRelease Liposome bursts open to release Keratin, Arginine, and Rosehip Oil. Keratin and Arginine penetrate the hair to repair damaged sites and strengthen hair, while Rosehip Oil adds softness and shine to the cuticle layer. The result: instantly 50% less breakage, and a continuous release of healthy-hair ingredients makes hair stronger and less prone to future damage. How do I use Defy Damage ProSeries 1 and 2 as a stand- alone treatment? Spray onto dry hair (following the spraying tips from the hangtag). Then shampoo and follow with ProSeries 2. Leave in hair for up to 5 minutes, then rinse thoroughly. We recommend using the Defy Damage Protective Shield to blow-dry the hair after treatment for added protection. How long does the SmartRelease Technology continue to work in the hair? Our lab testing shows SmartRelease liposomes remain active on the hair through three shampoos. Does the Defy Damage ProSeries replace the K-PAK Hair Repair System? 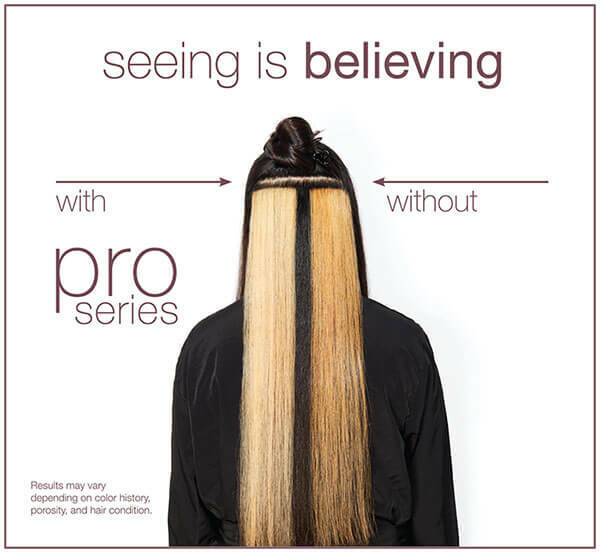 No, the ProSeries is for ultimate damage prevention and color perfection. The K-PAK Hair Repair System is formulated to treat moderate to severely damaged/compromised hair. Who is it for? Stylists who want a simple solution to protect and strengthen hair before, during, and after chemical processing. Consumers who are concerned about all types of damage and want to take a daily, pro-active approach to prevent it. Stylists treating clients with existing damage in need of repair. Consumers with moderate to severe damage. Stylists who want to protect haircolor long- term and add shine and smoothness that strengthens hair’s internal structure and reestablishes its B-Layer (outer lipidic layer). What’s inside? Joico’s exclusive SmartRelease technology, the highest concentration of bond-building Arginine, Moringa Seed Oil, and a Protective Lipid, for pro-active damage prevention that protects and strengthens inner and outer hair bonds. The highest concentration of core technology, strongly based on our heritage of using keratin protein to strengthen hair precisely where and when it needs it. QuadraBond Technology: a protective combination of Arginine, dual polymers, and African Manketti Oil that repairs and seals hair’s cuticle for stunningly vibrant, lasting haircolor. When do I use it? Use every day as an ongoing defense system to prevent damage, and protect hair from chemical, environmental, styling, and UV exposure. Use to repair damaged hair as needed. For everyday haircolor preservation and protection. Do I need to spray Defy Damage ProSeries 1 before a toner? It is not necessary since you used ProSeries 1 before prelightening; the most damaging service. Can I use a cuticle sealer along with Defy Damage ProSeries 2? It is not necessary to use a cuticle sealer with the ProSeries. ProSeries 2 balances pH for optimal bond regeneration and color protection, all without interfering with color deposit. Do the Defy Damage Protective Shampoo and Conditioner help with color longevity? Yes, but for best results, we recommended using the Defy Damage Protective Shield in conjunction with the shampoo and conditioner.